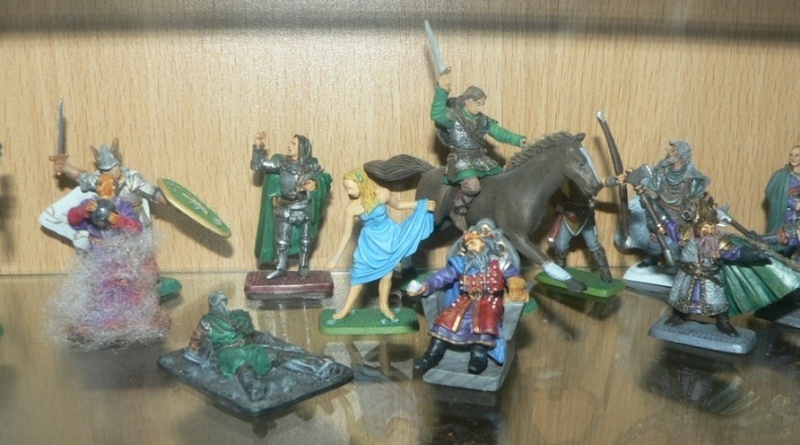 well as I do/did not have time yet to make good pictures for the gallery for individual references or scenes or dioramas, I'll just post a little sample here of some of the last (or some former...) figurines I have painted of late. Very nice ! :-) three trolls and Dunharrow rider are great ! well thanks a lot for the trolls ! but what about the other figurines? Well, don't you all get me wrong ,please, but until now I still cannot cope with that appearance of the oathbreakers of Dunharrow as they were presented by P. Lackson in his movie. For me that was one of his worst ideas in the trilogy. The painting instruction of that other company (I will not name here) of course comes close to the way the army of the dead was presented in the film. That greenish, slimy but shiny choice of colours to me is absolutely inacceptable and does not fit at all. - Alright, it's just my point of view and I don't want to criticize anybody who is of a different opinion. I just could not hold back this comment as that choice of ill-green colours hurts my eyes. By the way there already were some very nice Mithril figures of deads in the old M-series. Fortunately nobody decided to paint them in such a ridiculous colour "scheme" as Jackson chose to present, as far as I know. well I have to agree somehow with you master ent, I am not very fond of my own greenish painting I'm trying to find an in-between with the King of Dead I am currently painting. As far as I can see, your painting skill is Very good Master Gildor. T0anks for showig ! I like also you colors for elves. I wish I could paint as many as you manged to. All nice work Master Elf. Agree with the Tree (rhyme not intended ) that PJ's green ghouls were spoilt by their rendition which was a shame as I liked the look of them under the luminosity. I painted mine pretty much as I think they would have looked had the existed, i.e. 'natural' colours but faded and dirtied. Would love to have had some more in the Mithril range! p.s. If I get to it (having just moved house in June) my next, almost completed project is (Master) Gildor and the Elves meeting the Hobbits . hm :-) .... news from the David's "Diorama manufactory workshop"... sounds great ! 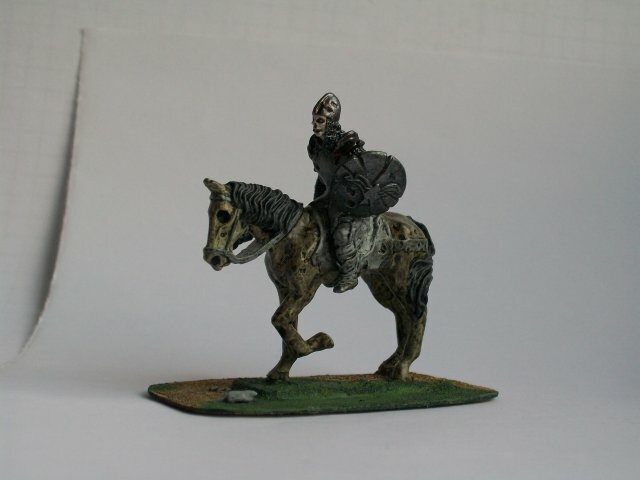 This is how I painted the Dead Rider : rotting flesh for the horse, manes and tale black, leather and cloaths of the rider only grey tones, the head 'bleached bone' and white highlight, and metallic for the chainmail, helmet, and weapons, all washed with black inkt.